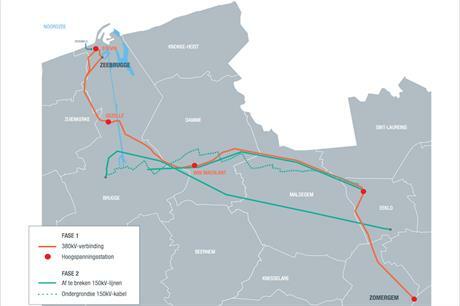 The €340 million high-voltage line between Zeebrugge and Zomergem will transfer up to 3GW via the connection to the Modular Offshore Grid (MOG), which extends 40 kilometres off the Belgian coast. It will also aid the integration of energy between Belgium and the UK via the 1GW subsea Nemo cable from 2019 and will support future offshore wind farms including the 309MW Rentel and 252MW Seastar projects. The Stevin Line will also transfer energy from the existing 216MW Northwind, and 165MW Nobelwind and Belwind sites. Now that the Stevin line is operational, the TSO plans to demolish 53km of old lines, 35km of which will be placed underground. The work will last until 2020, Elia stated.